Warriors F.C, A Belizean youth football club, attended international youth soccer camp Rush Fest in Colorado Springs, Colorado in the United States. The team, comprising of 16 young footballers between the ages of 12-13, played their first game on Monday, July 10th, comfortably defeating a team from Michigan USA, 8-0. 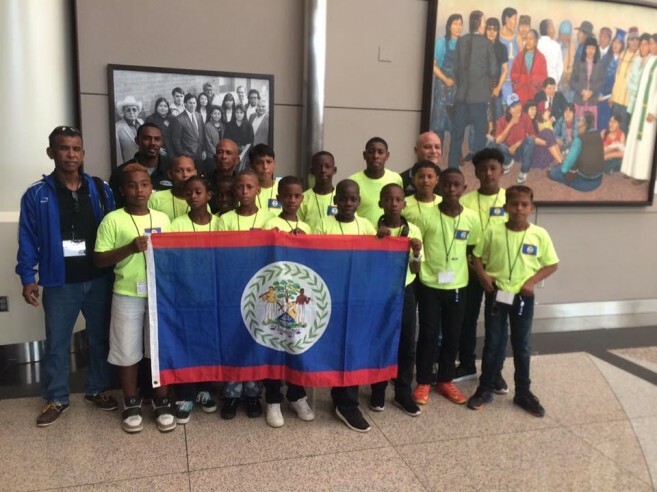 Considered at-risk youth, it was the Belizean athletes’ first visit to the U.S. According to Country Director Daniel Fabro, it is expected that this experience will promote the physical and mental well-being the athletes. “This soccer camp aims to provide the finest soccer experience possible, by teaching the fundamental skills of the game and developing athletes through organization,” he said. ”The entire experience will be life-changing for these youth, most of whom come from challenging backgrounds.” Warriors F.C continued playing against other teams throughout the week, with the camp concluding on Friday, July 14th in grand ceremony. Warriors F.C would like to thank all the sponsors who made their participation at Rush Fest 2017 possible. A BIG THANK YOU goes out to: Jonathan Methal and Glass (USA), Kalim and Gigi Habet, CISCO Construction, Holy Redeemer Credit Union, Gentrac, Belize Bank Ltd, Belize Telemedia Ltd, Fabrigas Ltd, Belize Waste Control, and Belize Social Security.